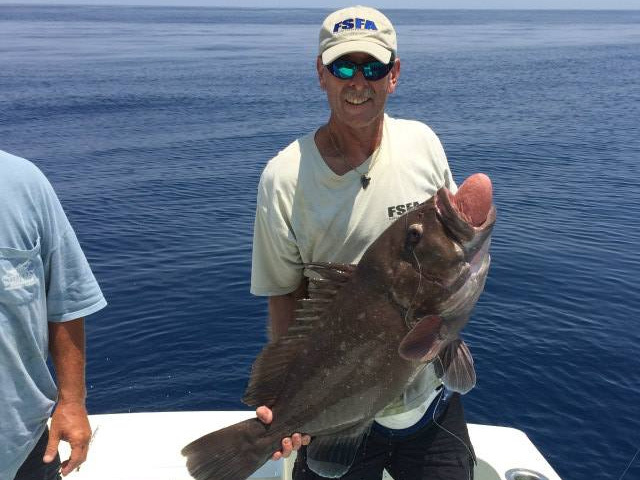 Our Port Canaveral deep sea fishing charters target fish that are biting! Our goal is to get you out on the water to enjoy the day and catch as many fish as possible. The most exciting thing about Cocoa Beach deep sea fishing is the versatility. From deep water bottom fishing for trophy Grouper, Snapper and Amberjack, to trolling for Dolphin (Mahi Mahi) and Wahoo, live-baiting for King Mackerel and sight fishing for Cobia. We also offer Port Canaveral Sportfishing trips that target Sailfish & Tuna and near shore trips for many different species of Sharks. Our location lends itself to a wide variety of year-round opportunities. Give our Port Canaveral charter fishing service a call today if you wish to target any of the following species. 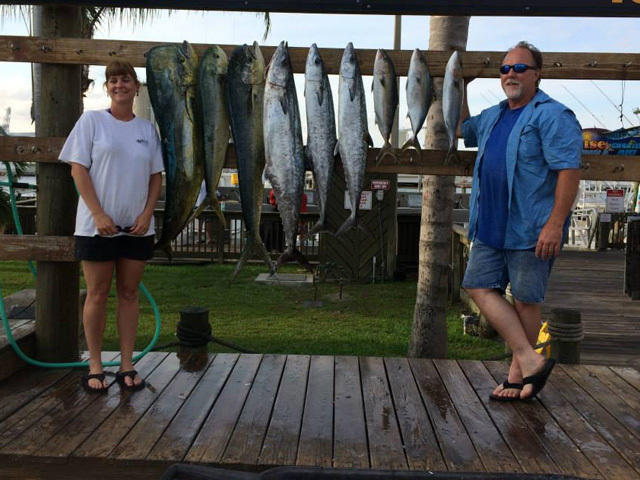 King Mackerel fishing trips are fun for families and anglers of all ages. We use light tackle and the hookup to landing success ratio is high. These fish are colored iridescent bluish green on their backs with silvery sides a streamlined body and tapered heads. Kingfish typically range in the 10-30 lb range with fish in excess of 50 lbs a possibility. Cocoa Beach, Florida hosts some of the finest King Mackerel fishing in the United States. Get Down Charters prides itself in our kingfish charter fishing tactics with live bait year round. King Mackerel are found both nearshore and offshore departing from Port Canaveral. During the summer months you can often find large Smoker Kingfish within sight of the beach, often just beyond the breakers. 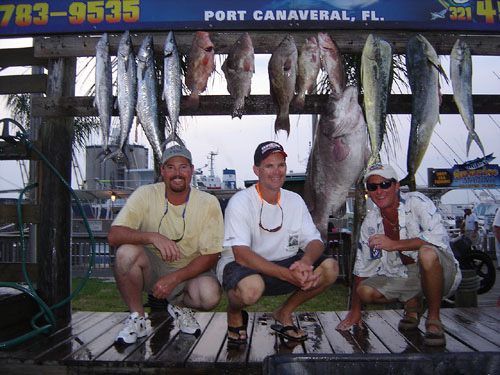 We strive to provide the most productive Port Canaveral kingfishing charters in the region. often called Dorado or Mahi Mahi - are a great fish for both beginners and seasoned anglers. Dolphin provide high flying action with acrobatic jumps and drag sizzling runs. With their iridescent hues of blue, green and yellow, Dolphin are among the more beautiful fish you are likely to encounter. A pelagic species capable of growing up to an inch a day, dolphin are most certainly a prolific species. They can range from only a few pounds to well over 50 lbs. They also make for some very fine table fare. Dolphin can be caught year round, with the best action occurring in April and May followed by late October through November. Natural and artificial baits trolled in 110-300 ft of water produce the most consistent results but plenty are taken incidentally while live-baiting for Kings in 80-100 ft of water. Call us today if you're looking to score a Port Canaveral Dolphin fishing charter. Cobia is another popular option for Canaveral area anglers. Much like Dolphin, Cobia are a fast growing pelagic species known for their strength, stamina and excellent table fare. Cobia are taken year round with the best numbers occurring during February through April. The spring run is a "hunt and seek" fishery and can be quite exciting when it's happening. We'll locate fish near manta rays, turtles, whales and bait pods and sight cast with jigs and natural live baits. It's not uncommon to have multiple hookups once we locate the fish. As with Dolphin, Blackfin Tuna and Sailfish, we'll catch plenty of Cobia while live-baiting for King Mackerel throughout the year. Our Cocoa Beach charter fishing company is eager to put you on a trophy Cobia! Grouper Fishing can be spectacular offshore Cocoa Beach. With easy access to a variety of available depths to target these prized fish, Port Canaveral is arguably one of the top grouper fishing charter destinations on the Eastern seaboard. You are likely to encounter a wide variety of grouper species including Gag, Scamp, Red, Black, Warsaw and Snowy grouper. Grouper typically range from 15-40 lbs with some species exceeding 60 lbs or more. While grouper fishing is available year round, the best action occurs from late Fall through Spring. These powerful fish offer knuckle busting action and all species are considered excellent table fare. Call us today to catch large Grouper on your next sport fishing Trip to Florida's Space Coast. 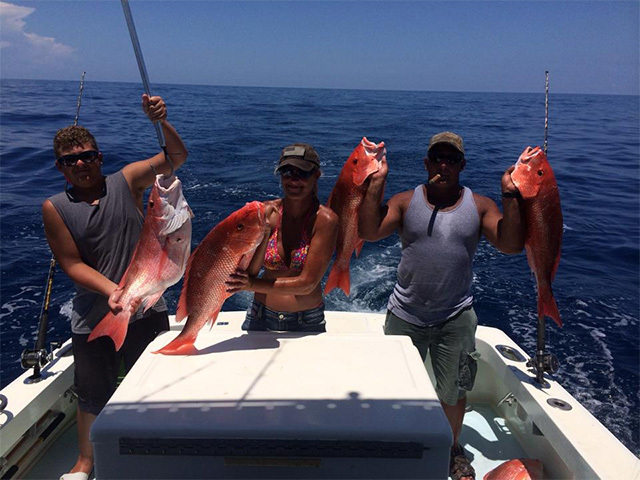 Snapper Fishing Charters are also quite popular in the waters offshore Cocoa Beach. 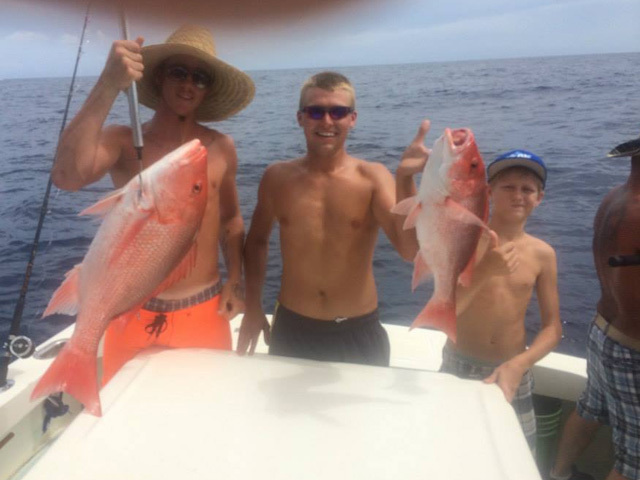 American Red Snapper is the prized species but good numbers of Mangrove, Lane and Vermillion Snapper are available as well as the occasional Mutton and Yellowtail Snapper. 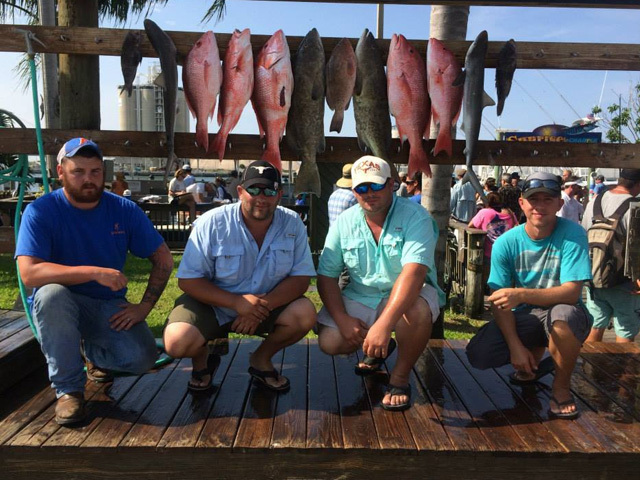 Considered excellent table fare, Snapper fishing charters are available year round, with certain species more prevalent during various times of the year. Snapper species range from a few pounds to well over 30 lbs. 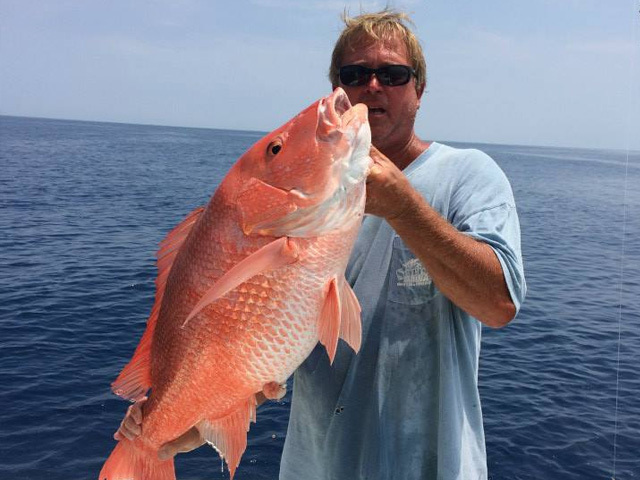 Call us today if you're interested in a Port Canaveral Snapper Fishing Charter. 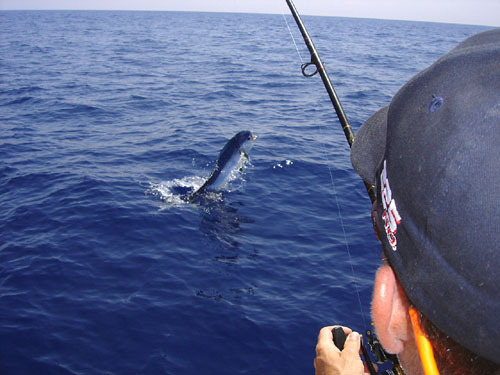 Amberjack Sportfishing Adventures are full of fight & excitement for all anglers. Pound for pound, Amberjack are one of the strongest fish you're likely to encounter in the waters offshore Port Canaveral. Amberjacks are a blend of brown, gold and iridescent purplish colors. Although Amberjacks are generally bottom feeding fish, they may hit above the bottom especially near artificial reefs or other submerged objects. It is common when Amberjack fishing in Port Canaveral and Cocoa Beach to catch these powerful fighting fish in the 30-50 lb range but brutes in excess of 60 lbs are not un-common. Call us today to catch large Amberjacks on your next Sportfishing Trip to Cocoa Beach, Florida. Wahoo fishing charters are another popular offering for Port Canaveral visitors. The best action typically occurs in late winter to early Spring with random fish available throughout the remainder of the year. Wahoo will fall for both natural baits and high speed lures trolled over structure in 130 to 300 feet of water. They are also caught incidentally while live-baiting for Kings along the reefs in 80-100 ft of water. Average Wahoo range from 20-40 lbs with the occasional beast in excess of 80 pounds always a possibility. Call Get Down Charters to book your next Port Canaveral fishing trip to target Wahoo. Tuna Port Canaveral fishing trips are exciting because of the tremendous fight these warm blooded fish exhibit! 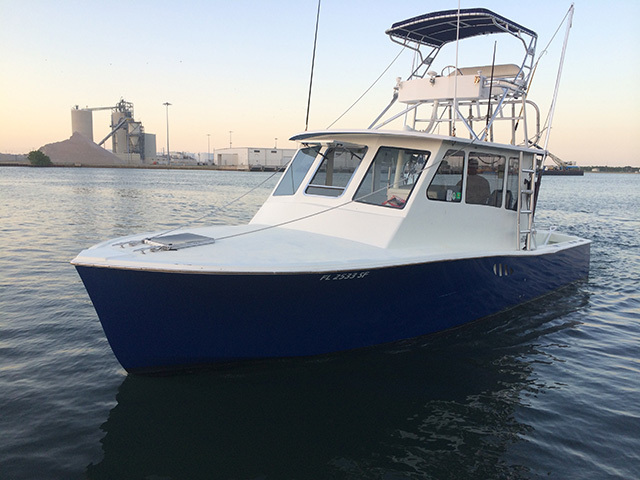 Our most popular offering is our Blackfin Tuna fishing trip. The average Blackfin Tuna we catch offshore of Port Canaveral are typically in the 15 to 30 lb range. The hottest action occurs primarily in the winter months from November to March. While we do have Yellowfin Tuna out of Port Canaveral, these fish are almost exclusively found on the "otherside" of the Gulf Stream. Long runs, decent weather forecasts and finely tuned radar is a must for locating these prized fish. Give our Cocoa Beach charter fishing company a call today if you're interested in targeting Tuna. Sailfish Charters are a popular trip off Cocoa Beach, Florida. While sailfish are available year round, the best numbers occur during December and January. As winter approaches, Sailfish migrate South following schools of bait fish. The sailfish bite after a cold front during the winter months can be phenomenal. Sailfish are very acrobatic, beautiful and a great adversary to hook up on light tackle.